In honor of its first anniversary, the Brooklyn Community Foundation announced its first-ever online Brooklyn Do Gooder Awards campaign to identify and honor local individuals who embody the highest values of community giving and service. The campaign invites the broader Brooklyn community to nominate and vote for individuals who display an outstanding sense of giving back locally—with time, talent or charity online at www.DoGoodRightHere.org. 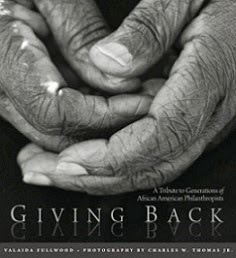 The campaign will culminate at the Foundation's anniversary celebration on November 3, 2010 at the Brooklyn Botanic Garden’s Palm House, where the winners will be honored. 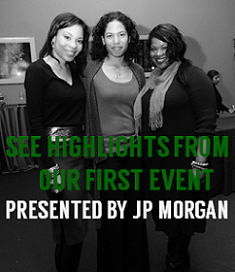 “The work of the Brooklyn Community Foundation is to encourage giving and service to our communities. Through this effort we hope to recognize those Brooklynites who are giving back everyday to make our borough stronger and kinder. Our motto is Do Good Right Here, and we want to encourage the public to nominate and vote for those people who exemplify that spirit of generosity and goodness in their community,” said Marilyn Gelber, President of the Brooklyn Community Foundation. Brooklyn Do Gooder nominees should have a demonstrated commitment to Brooklyn through their work within the Foundation’s five fields of interest: Arts for All, Caring Neighbors, Community Development, Education and Youth Achievement and Green Communities. 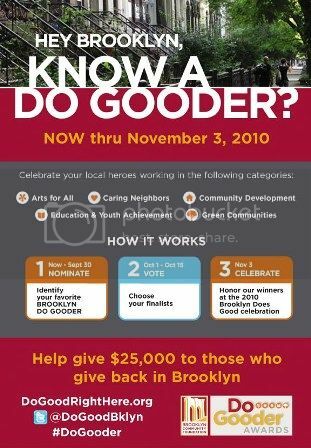 Each of the five winning Brooklyn Do Gooders will receive an award as well as $5,000 to be used as a reinvestment in a recognized 501(c)3 charitable entity working in Brooklyn or in a Brooklyn Community Foundation Field of Interest Fund. Anyone can nominate and vote for a Brooklyn Do Gooder 18 years of age or older. Online voting will help determine 20 Brooklyn Do Gooder finalists, after which a distinguished panel of judges including WNYC’s Laura Walker, Freelancer Union’s Sara Horowitz, MoCADA’s Laurie Cumbo, and award-winning author Peter Hedges will choose the winners. Nominations are being collected through September 30, 2010; Online voting will be open from October 1-October 15, 2010. The Brooklyn Community Foundation is a nonprofit organization dedicated to improving the lives of people in Brooklyn through grantmaking and by encouraging local giving and community service. The first and only one of its kind in Brooklyn, the Foundation was founded in 2009 to support the borough’s most effective nonprofits in five Fields of Interest: Art for All, Caring Neighbors, Community Development, Education and Youth Achievement, and Green Communities. Since 1998, operating as the Independence Community Foundation, the Foundation distributed over $70 million in grants throughout New York Metro area, more than half of which was in Brooklyn. Learn more at: www.BrooklynCommunityFoundation.org Follow on Twitter @DoGoodBklyn.